The collection of data has exploded recently. Though computers have been around for only a few decades, it may surprise you to hear that over 90% of all data stored on our planet has been created and stored in the last 2 years. This is nothing to be overly concerned about; data collection allows for better organizing, quicker access to important information, and allows humanity to live a much more productive life. With that being said, a data security breach where someone can access your personal data is the last thing you would ever want to deal with. In the education sector where schools collect and store private student information, this should be a serious concern. Most schools today store student data such as personal info, addresses, birthdays, grades, teacher’s comments etc. But schools need to be continually vigilant about the security of the data they collect. Students all across the country have found their identities stolen and then used to open new credit card accounts, get loans or obtain employment. Identity theft has become such a widespread problem that the State of Florida has recently passed a new law that allows parents to freeze their child’s credit record so identity thieves can’t destroy it. If a school is unable to keep this information secure, there could be long term disastrous consequences for their students. The best protection is to devise a plan now and be proactive in preventing security breach threats for the future. Document and designate: Schools should have a documented list of what data they are storing. The school IT department should designate the specific location where this data is to be stored. Documentation should include who should have access to the data and address scenarios where the data might be moved to another location or device. Lock it down: Although this seems like common sense, many IT Administrators often focus on the software security part of their data but forget the physical access. Data should be stored on servers or storage devices that are physically protected from theft and access. Create an access list: Data should only be accessible on a “need to know” basis. IT should have strong security policies implemented to protect the access of data. These policies should include who can access the data, where they can access the data from, and from which device(s) the data should be accessible. To make this effective, old user accounts and access need to always be eliminated immediately when an employee or student no longer needs access or departs. 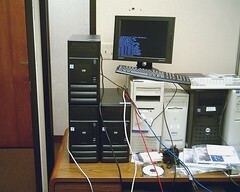 Secure devices used on the network: Students and faculty have many gadgets of their own that are just begging to access a school’s network. If your school provides free Internet make sure that your data is on a different network. For devices that will access sensitive data, require that management and protection software is installed. Mobile devices are especially vulnerable. These devices are easily lost, stolen or shared with others. Data encryption: Data encryption ensures that if any of your data is stolen then the culprit won’t be able to access any of the stolen information. Not only should files be encrypted, but any emails sent with personal information should be encrypted as well. Encryption solutions often cost money and require implementation, but it is worth it to save your data. Wipe data when it’s not needed: The more data you store, the harder it is to manage and keep all of it secure. When a device is de-provisioned, or changes hands, make sure that all data is wiped clean from the previous user. Make a plan and stick to it: Don’t deviate from your policies and plans just because it’s convenient. Keeping data secure is not a passive activity. Securing data requires work, effort and a constant focus on improving your policies and process. The ideas expressed are opinions and suggestions. These ideas certainly are not an all-inclusive guide to data protection. If you have ideas or methods you have found to be useful please share them with others in the blog comments section. Ultimately, we just want to help keep our data safe and secure.